When an entire organization and its partners understand the same information to have the same meaning, the company can make and sell products faster, connect more effectively with suppliers and customers, improve business process efficiency, and simply make more money. An MDM initiative also helps a company improve its data quality and consistency; develop applications more efficiently; and eliminate the costs and waste born of poorly managed data. But organizations are discovering that an enterprise MDM initiative can be a complex and expensive endeavor. In fact, preparing for an MDM initiative requires substantial cooperation among numerous internal and external groups—a tall order for many organizations. To work optimally, people from several functions and departments must come to a consensus on master data—what comprises it, what defines it, and what its sources are. Some departments may have to make sacrifices and endure dramatic changes. 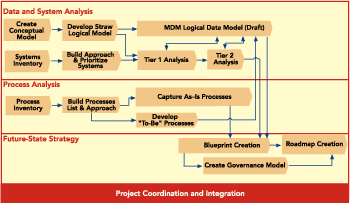 An MDM project’s scope must be defined clearly to realize its promise. When teams maintain a sharp focus, gains made via MDM are often real and significant. Identifying business value–based focus areas is critical. Initiatives such as supplier and product “on-boarding,” customer retention, and transportation optimization create an impetus for MDM as well as a tangible system and information scope. This focus, however, often means that not all parties benefit in the near term. As a result, prioritization and flexibility also become critical. Executives considering an MDM initiative can learn a valuable lesson from organizations that have tried to tackle an enterprise data warehouse all at once. Many largescale data warehouse projects include many, if not all, of a company’s subject areas. This approach is risky because of the lengthy time frame involved and the extreme complexity in developing an entire solution on the first pass. A safer, more effective approach, one that assesses, prioritizes, and implements iteratively, has a much higher chance of success. This also holds true with MDM. By assessing the existing environment, prioritizing areas that reap the greatest benefits, and implementing in a phased manner, success is considerably more likely than with a “big-bang” method. Once the strategy has been defined, a practical, multi-phase approach must be developed. The first phase (technology and data management) entails assessment and analysis of systems and applications with regard to master data—where data is stored and how it is managed or used. It also includes activities that define master data and develop a logical data model. The second phase concerns business process and data quality—documenting existing processes and developing future ones to support the solution. Master data management is as much about process improvement as technology implementation. A data governance phase follows. Many projects/systems falter due to a lack of ongoing sponsorship and commitment. What once seemed like the right solution, if not constantly revisited and updated, may quickly become inappropriate in a rapidly shifting business climate. It is especially critical to identify definitive data and data management process owners to create the appropriate environment for clear data definition, consistent data management, and accountability for data availability and quality. Establishing a governance model that will work within the targeted organization is integral to long-term success. Finally, companies need to employ a solid dose of realism. Often, MDM is not about centralizing data into a single tool, but centralized management of data across the existing application set. It may be more prudent to extend the capabilities of the existing applications and improve data integration than to try to implement a centralized MDM toolset. Sensible, pragmatic expectations are critical; in fact, the companies that have the most success with MDM are honest with themselves, employ a practical approach, and maintain a holistic, open-minded perspective. Matthew J. Beyer is Senior Architect at Collaborative Consulting.